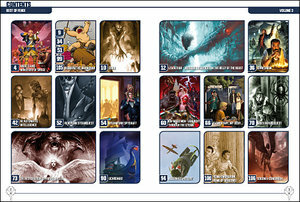 Best of Fenix includes some of the best gaming material from the Swedish gaming magazine Fenix – translated to English. 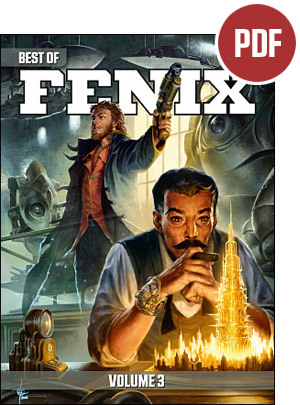 In Best of Fenix you will find inspiring material written directly for Fenix’ readers by renown international game designers such as Kenneth Hite and Pete Nash, but also some of the best from the Swedish arena. To top it off, we got our own comic strip Bernard the Barbarian, created by Åke Rosenius and at least one standalone game in every issue. Steampunk and space travel are two of the main ingredients in this volume. Another is angels and demons and the havoc they can create here on earth. Angels and Ministers of Space – Kenneth Hite on Newtonian angel powered space travel in an alternate 17th century on the seven planets. An inspiring article fat packed with weird. Leviathan - Baroque Escapades in the Belly of the Beast – Leviathan is an rpg by Daniel Krauklis and the name of an interstellar ark starship floating through cosmos without anybody at the helm, populated by a race who no longer remembers its past. Baroque Escapades in the Belly of the Beast. Ichneumon - A Parasite Steampunk RPG – A brilliant parasite steampunk rpg by Kenneth Hite. This game infects your existing steampunk game, living behind its scenes, warping its stories and affecting the characters. 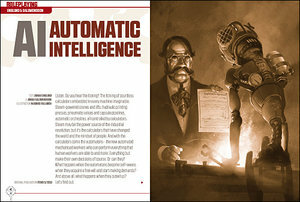 AI: Automatic Intelligence – Johan Salomonsson and Johan Englund combines I, Robot and Das Kapital in this steampunk setting full of inspiration and scenario seeds. RunePunk SteamQuest - Pete Nash on how to steampunk your RuneQuest gaming experience. 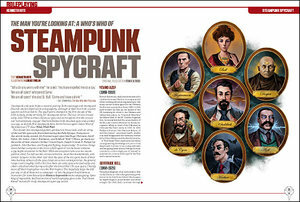 The Man You’re Looking At: a Who’s Who of Steampunk Spycraft – Kenneth Hite’s dossier – a Who’s Who of Steampunk Spycraft - lets steampunk gamers get down to brass tacks with an array of the real-life spies who flourished during the Belle Epoque. Un-Made Men – Anarchy through the Steam – Kenneth Hite presents five fiendishly fantastic anarchist groups and six terribly terrific anarchists in this follow up to The Man You’re Looking At: A Who’s Who of Steampunk Spycraft. Historical & Fantasy spies in RuneQuest - Since espionage has been an inherent part of both literature and history since ancient times, it places spies and spying firmly within the bounds of genres normally used in RuneQuest campaigns. But suave super-agents like Flint or Bond aside, what exactly is a spy? And how can they be used in a campaign? Pete Nash guides you through the answers in this article. 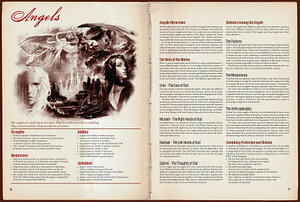 The Restoration of Paradise Lost – Christoffer Krämer has turned the eternal celestial love triangle in to a roleplaying game, where the players take on the roles of angels, demons or humans. Djinn - Pete Nash takes a closer look at these sprits Between Heaven and Hell and how they can be put to use in your own campaign. Uchronias - David Bergkvist presents five short alternate history settings, for direct use in roleplaying campaigns. Alternate History (RuneQuest) - Pete Nash uses the aspects of Time, Region and Changes as the foundation for creating an alternate history. These are framed as a series of tables which will make the outcome both random and strange. After all, it is the oddness which makes an alternate history so much fun to play in. Roma Umbrarum – X-Files meets Gladiator in this horrifying fantasy campaign set in the city of Rome during the reign of the infamous Emperor Nero. Anders Blixt wrote this article for the second issue of Fenix ever. Elementary, my dear … - This Café Game by Christoffer Krämer is directed toward people who wish to while away the summer by lazily watching the passersby at the city’s outdoor cafés and coffee shops, and enjoy playing a little game at the same time. Here is a game that combines those two activities: lazy people watching and gaming. Sodom & Gomorrah – Mastermind meets Battleship in this puzzling board game by Christoffer Krämer, where the player’s goal is to find the ten righteous in order to save the cities. Sodom & Gomorrah will be included in the pdf and the books. In the Deluxe edition you will find a separate insert with the game props printed on thicker paper as well. Bernard the Barbarian – Fenix’ own comic has been a part of every issue of the magazine. Åke Rosenius, Sweden’s funniest gaming cartoonist, has created this sly, lazy barbarian, mostly interested in beer and women. In this issue you will find a full page of comic strips with Bernard the Barbarian based on ideas by Evelina Rosenius, Åke’s daughter.